Hello, I am so glad you are here! Looking for free home organization printables? Do you get overwhelmed trying to keep your household organized? Do you have trouble keeping track of important documents, dates, or other info? If the answer to any of those questions is YES, then you’ve come to the right place. We’ve got several Free Home Organization Printables to get your started on your path to an efficient home. Not only are these printables essential to getting your home in order, but we are offering them for FREE! Hi – I love these! I tried to click on the 2015 printable calendars but couldn’t make it work. Could you help me find the right link? ARE YOU GOING TO BE MAKING 2016 CALENDARS AS WELL THIS YEAR????? HI!! Absolutely love this website, thank you for sharing the designs!!! I really like the floral 2016 calendar and I was wondering if the Home Organization Pack will be available with the floral theme as well? Hi Marie! These are just what I need in my life and they are beautiful! It makes organizing fun! The downloads and links are not working for me. Could you email me the yellow and gray directly please? I’m emailing it over now. Could you also email me over the yellow and gray downloads? I am also having trouble getting them downloaded! Thank you so much!!! I just emailed them over! Hi Monique, unfortunatly they are sized for a standard 8.5 x 11. I am working on a new set specifically to fit both sizes including smaller planner size! Thanks, as I found them too good and practical. Hi Yayeena, You can find a link to these on the second page, or sign up for my email list to get access to the floral style available to subscribers only. Hello! I absolutely love all your printables! Thank you so much. The only issue I’m having is that after downloading, (yellow & blue) calendar the numbering for the days for the months of February & July are blank…only showing black spots in those areas.?? That is so weird, I have double checked them and they are coming up okay on my end. My only suggestion is to try on a different printer or take them to staples and have them printed there? Sorry, that is so odd. I LOVE this! I want to print these, but our printer is down. Is there a way to send it to staples, but not with all of the sheets? Can I pick and choose? I can’t figure it out. I’m not sure…I have a crazy time of ordering online. One thing I have done is put it on a thumb drive and sometime they will let you back at the computer and you can show them which files to print. (page 3 or page 7 for example). Email if you need me to send you something individually and I can do that for you. I just came across these, I love them!! I have saved them all so i can have them printed when i get ink. This is going to help me so much, especially living in a new city and state. Thank you so much!!! You are so welcome, congrats on your new move! I absolutely love this!!! Its great. Did you do this in word, or publisher or something like this. I am going to try and make a recipe book to match the same kind of color palate and design and was wondering how you found some of your backgrounds and fonts. I create most of them in Photoshop and then import into publisher to convert to pdf. I just googled popular free fonts and got most of them off of dafont.com. The designs I created myself in photoshop. Hope that helps! i can’t seem to get the printables to work . I wanted the navy and coral 2015 calendar as well as the Home Organization Pack. Please help! I can email them to you. I don’t but I wonder if the pdf’s could be sized down by staples or something? I absolut.y LOVE this set and will be sending it to staples to print out. However I am a bit of a freak and am wanting everything to watch and be co-ordinated so I was wondering if you had made up something like this for budgeting and bill paying etc…. Thanks again! I haven’t made a budgeting and bill pay one available for download yet, but I am working on one that coordinates so check back soon! I cannot get the navy/ coral organization binder or the cleaning package to open in dropbox. It keeps telling me that the page doesn’t exist anymore. Can you please email them to me? Kendra.nicole8707@gmail.com Thanks!!! Sure Brittany, I’ll email it right now. Can’t get them to download. Please email the templates. Wendy, let me know which color you would like and I can email you the files. I absolutely love that you did and LDS planner! Love everything else as well!! I totally loved these! Very useful! Do you think you would create them for a classroom? It would be really useful to have something like this in the class (with assistance, birthdays, parent’s phones, etc) to help solve the little craziness we have in there! Thank you! That’s a great idea, I’ll look into that and maybe I can get some created for fall when school starts back up. I just downloaded these… I truly love all of your printables!! I’m a new fan of your site. Thank you so much for the calenders! Im a house wife and mom of a 16 and 10 year old. These will help a lot !! Thanks for stopping by Shellie, so glad these will be helpful for you. I know they keep us organized. I am a little behind the bandwagon here, just starting to try and get organized half way through the year lol! But i can’t seem to get the files to open to save or print. Could you send me the organization packet, the 2015 calendars and the lds packet and cleaning packets in the yellow color scheme? I would really appreciate it! I love your stuff its all so adorable! Hi Diana, I will email the files over to you! I love your printables! However, i can’t seem to get it to download properly. is there any way you can email me the Coral/Navy Organizational Binder? ukfan1231@gmail.com Thanks so much for putting all these together. So sorry for the downloading issues, I’ll email them over. I CANNOT GET THEM TO DOWNLOAD. COULD YOU SEND THEM TO MY EMAIL? I WOULD LIKE THE YELLOW/GREY ONES! I CANNOT WAIT TO START USING THEM! These are absolutely wonderful and beautiful. Thank you so much! I am wondering, would it be possible to get a page which is the plain yellow quatrefoil which is the background behind the cover page “My Family Planner”? I would like a decorative sheet to slip into the back cover of my binder. If not that is fine, I just figured I would ask. Hi Emily, That is a great idea. I will design it this week and email it over to you! (If you don’t receive it, you can send me an email reminder. I love your printables! I seem to have the same problem and can’t get it to download. Is there any way you can email me the Coral/Navy Organizational Binder? kap2831@gmail.com Thanks so much! Thanks so much Kristy, I went ahead and emailed it over. Let me know if you need me to send it again. Really love the blue/yellow/grey home organization printables and the calendar, but I also can’t get them to open for me! Could you please email them to me? Thanks in advance! Yep, I will email them over! I love the coral/navy family planner an LOVE the LDS planner but can’t get it to print. So sorry to bug you but can you email them to me? No Problem Brookee, I’ll email it over. Taylor, that is fine. I would ask that you not promote them online though as mine were the original for this set. I created the designs myself and used various fonts but I am sure you can come up with something that will match. I know how it is to want things to be cohesive. I love these and think their so cute but im not sure how to print them. can you help me? You just click on the link to go to dropbox, it will ask you to sign up but just close the box and you should still be able to download without creating an account or having an issue. If you can’t get that to work, you can email me and let me know which printables you want and I can email the files over to you. so it doesnt print out a full page. is it possible for you to email me the file completely? runs on to another page so it actually prints out half pages. Sure, I’ll email a zip file over. Make sure you have your printer settings to full page. Sure, I’ll get those sent over. Love the planner & calendar in Navy/coral….any chance you would be up to creating a 2016 calendar!?!? These have been great for our homeschooling family. Hi Stacy, I am working on the 2016 calendar as we speak! Hopefully it will be available soon. I love your designs! Wondering if I can get the yellow/blue/gray calendar for 2016? Hi Becky, Yes I am working on the a calendar for 2016 and it should be available soon! Thank you for the printables!!! love them!!! can you tell me the name of the font you used for the word “printables”? Hi Amanda, I believe it was Carolyna Pro font. Hope that helps. Love your printables. Is it possible to size them so they can be cut to fit A5 paper or a personal planner I wonder? I will have to do some investigating. You have terrific ideas and I can see why your home organizational designs have been pinned 65k times! Go you! Thanks Elannah, I am not sure. You could maybe select it to size it when you go to print it? I love these! I was wondering if you could e-mail these to me? The coral colored ones. I cant seem to get them to print the correct way. Thanks in advance. Yes, I will email them over to you! I’d love to get the home organization printables, but it says there’s an error when I go to the link. could you possibly send me the yellow and grey AND the navy and coral? THANKS SO MUCH!!! Thank you SO much for providing these printables for free! They are beautiful and just what I need to get organised! Any chance of updating the monthly calendar printables for 2016? Thank you so much!! They are beautiful! Love this! But can not download. Can you send me copies of both colors for all files? Also, can you change all font from grey to black letters? Unfortunatly I cannot change the colors. I spend countless hours getting these put together and changing fonts for each one would take forever. Send me your email and let me know which files you would like and I will email them over. Thank you again and wish you all the inspiration in the world! Love these printables so much! Love the black and white with the flowers, did you have those in the other printables besides the calendar? I didn’t see it but would love it! Hi Chelsea, I should have the new coordinating printables up this week! Sure, I just need to know which ones you wanted. HI, I love your coral home organization printables! I am having trouble opening them, could you please send them to me? Hi Marie, I am in love with your grey and yellow home management folder!! i am so excited to use them!! i have been working on my binders all day! i am wondering if you have a budget/ financial section that matches your grey and yellow management folder? Hi Tausha, I am finishing them up and will have them available soon! Hi Marie! Thank you so much for all your hard work in providing these printables! My word for 2016 is SIMPLICITY! These will help out tremendously. Would you mind emailing me the yellow and grey home binder and cleaning sheets? If you don’t mind. That is a fabulous word for the year! I will email them over now. Wow, great stuff. THANK YOU!!! Extremely helpful. Will you be offering a version for 2016 calendar? Hi, Happy New Year. I absolutely love these but I can’t the link for the home organization pdf to work. Keeps coming up with a blank dropbox page I was wondering if you could email them to me at laura-murdoch@hotmail.co.uk. Thank you so much. I am not sure why, thats odd. I’ll email them over now! I am having trouble dowloading the yellow and gray printable package. I got the calendar just fine. could you email me the organizational binder package in yellow and gray? Thank you. I love your work! Thanks, I am emailing it over now. Love the navy/coral home organization binder! I can’t get the link to work to download:( could you please email them to me directly! Thank you so much! I love the navy/coral! It’s not working for me either. Could you please email them to me? Thanks so much! Sure I’ll email them over now. I absolutely love the navy and coral home planner. Im not able to download it though. Could you please e-mail it to me? TIA! Hi!! Love these so much but having trouble printing. Can you please email me the link for the home organization the yellow/grey one!! Thanks so much. I’ll email it right over! Hi Nathalia, I actually had my website designed by a designer so I am not sure of the fonts used. Sorry to not be overly helpful. I do think one *may* be called Lobster? Thank you for this beautiful printable, they are practical and beautiful! great job! I am in love with the Navy and coral set!!!! I know you’ve been asked this a million times, but could you pretty please email it to me? I can’t get it to open at all, and I’ve tried from 3 devices lol I would really appreciate it!!! Sure Lindsey, I will email them over. I just wanted to say I am in LOVE with this coral/navy family binder printable. Thank you so much for sharing your hard work with us! I know how much time and energy is put into something like this and I can’t wait to incorporate this into my home organization tools. Great job! You are so welcome Jahnelle! Hello, I am trying to open the file for the floral printables as well as the coral and navy and am getting an error messge Could you please email them to woodard.laceym@gmail.com ? These are great and you are wonderful for making them available for free! I’m emailing them over now Lacey. Hi, I soooo love your blog and I really want to have the coral/navy family planner but I cant download them Sorry to bother but can you email them to me? thanks! Hi Marie, these are gorgeous, but I couldn’t find the link to download the flower themes. Could you please send over at withcariespui@gmail.com? Thank you. hey ! I was wondering if you could send me the yellow and grey file? It seems I cant open it on my computer? thanks so much ! you do beautiful work ! How do I login in the website? O.o Cause I want to download something, and ask me to login, but I can’t. I click and the url still the same, but with a # in the end. hi! I absolutely love your organization printables. I was wondering if theres any way I could add more doctors and prescription medications though. Also if theres a way I could expand the box for medical conditions as I have lots and lots of medical problems. thank you!! Hi Caleigh, at this time I don’t have any custom options…but I hope to in the future. I recommend using multiple copies of the sheet to house all your info. Hope that helps! dein Planer ist phantastisch. Ich würde mir ihn gerne auch ausdrucken. Gibt es auch eine Ausführung in deutsch. Würde mich über eine Antwort freuen. Thank you so much! The printables are only available in English. Hope that helps. danke für die direkte Antwort. Der Organizer gefällt mir zu gut. Drucke ihn mir aus und schaue mal wie ich das mit dem deutsch mache. Oder ich lege mir einfach nur eine deutsche Übersetzung dabei. Love the designs! I keep entering my email to sign up so that I may download the floral & it will not let me. Any ideas on how I can go about downloading it? Hi Carrie, did they ever come through? Once you sign up you’ll receive a welcome email with the download info. Hi, I’m interested on the floral home organizational and I can’t sign up. Is it ok if you email them to me please? Hi there, email me at bloominghomestead@gmail.com and I can get you added! You are so welcome. Which set are you looking for and I can email them over. The yellow/gray or navy/coral? 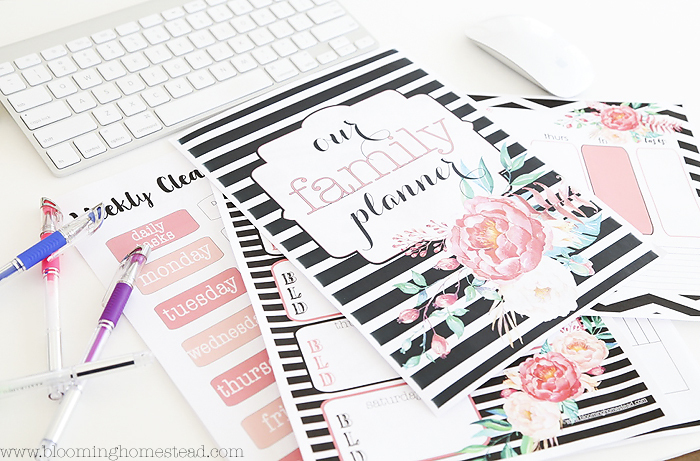 The floral home printables are available for email subscribers only. Marie, you’re Organizational Home Binder is absolutely amazing! I love the simple yet thorough layout of all the pages & the design is beautiful! I followed the dropbox link, signed up & unfortunately I’m still unable to download it. Im so excited to get my new binder going. Im sure it’ll help tremendously with at least some of the chaos at home. Hi Heidi, thank you so much! I totally know how that goes. Hope you can put it to good use. Hey!! I had the ultimate packing list saved and I cant find it is there a way to get it again? I love it so much and we’re about to go on a trip with our little one! I’m emailing it over now! Hey! Your printables are so adoreable, are you going to set them Up for 2017 too? I would appreciate that! Hi Verena, Yes I am, hopefully they will be ready by September. Will you be making a 2017 edition soon? I hope to have it out by September! I am having such a hard time downloading the yellow and grey planner set…..is there something that I am not doing right? Also, do you have a planner out for 2016-2017 and is this for a full sized notebook or a mini planner notebook that I just bought? (Praying that you have a mini one since I have already bought all the stuff for my mini one…. Hi Theresa, Unfortunately, I only have these in 8.5×11 size. I may create them in the A5 size but currently they are unavailable. If you want the regular 8.5×11 file I would be happy to email it over. Just let me know! I’ll send them right over. I really love the black and white floral design. Could I get that emailed? Hi Stacy, if you sign up for my newsletter you’ll receive a link and password to download the floral home printables. I am trying to find this printable in the floral print. Do you have those? Yes, you can sign up to receive them here. They are available to subscribers only. These are absolutely stunning and wonderful! I have signed up with two separate email addresses and I have still not received any type of email (after almost 2 hours) I checked my spam folder as well. Just curious if there is a reason or something else I should do. If not could you email them to me? Hi, how often do your newsletters come through? Also, about how long does it normally take for the email with the download for these printables to come through? You’ve done such a fabulous job designing these and I can’t wait to get started! Hi Kaitlin, You should receive an email within 48 hours. My newsletter was coming bi-monthly but we’ve been updating some processes and haven’t had newsletters since the beginning of the year. They will start back up March 1st! Hi Marie! I’m wondering if you offer or if it’s possible to receive an editable version of the navy/coral printable. For example I’d like to use them as a template but be able to type in things myself before printing. Hi Carly, I don’t have these in an editable version unfortunately. I used different programs for different pages and compiled them as a pdf to merge them into a complete file. Sorry! I wish these were editable. Finally got the email!!! Thank you! You should really make a recipe binder. That would be awesome. Like favorite recipes and the inside for breakfast, lunch, dinner, appetizers, desserts, and drinks. That would be so handy for all the recipes I have. But I suggest making the pages for the recipes to be editable so we can type onto it. I would love to do that, but I am not sure quite how to go about it. I’ll look into it! i have problem Printing out the our family planner. i really want the yellow and grey one. could you email them to me? I would love to subscribe to your newsletters and gain access to the printable organizers. Hello, I love love your organization printables. I’ve been having trouble downloading. If possible can you please email them to me? I would greatly appreciate it. Did you ever receive them? I don’t know if you still keep this site updated! but I have been signed up more than once and still have not received anything!!! So sorry about that. If you want to shoot me an email, I’ll check with my mail provider to make sure your email is added. I’m wondering if you will be doing 2018 calendars? Hi Rebekah, the new 2018 calendars should be coming in the next week or so!